JULY 31/15 UPDATE: The average high temperature for July 2015 was 15.8°C. It’s a new record. The coldest average high temperature previously was in 1962 with 16.1°C. July 2014 with an average high of 25.2°C was the warmest July on record. July 2015 is the coldest. 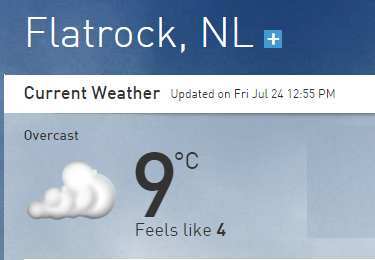 Typical July day in St. John’s, Newfoundland, and outlining areas for 2015. It seems that at least one month between May and October in Newfoundland is a complete write-off, weather so lousy that honey bees have little to do except hang out inside their hives and try not to go crazy. August was a bust last summer. I think June was a waste of time the summer before that. This year it seems that July is the junk month. The bees in all of my tiny nuc-sized hives are probably doing everything they can not to freeze to death today. 4 bloody degrees! What the hell, man? (That’s 40 degrees in Fahrenheit world.) It’s been like this for most of July, temperatures maxing out at around 15°C (59°F). This weather stinks. The forecast for August is looking better though. We might even reach 20 degrees. If it wasn’t for the fact that we keep them in wooden boxes and feed them when it’s cold to keep them alive, I doubt honey bees in the natural world could ever live in a place like this. On their own, they’d be dead in a year. Another reason why I don’t buy into the natural adjective used for beekeeping. Naturally, honey bees wouldn’t even be here. Anyway, I’m sorry. This weather is making me grumpy. This entry was posted in Month of July, Weather. Bookmark the permalink. Oh man, that really is bad. Wishing you some sunshine. Those Australian bee keepers don’t know how easy they have it. That weather is nuts! I can’t imagine what it must be like keeping bees up there. How do they ever make enough honey to get through the winter (with some surplus for you, of course)? Wishing some sunny days your way. The average high temperature for July 2015 was 15.8°C. It’s a new record. The coldest average high temperature previously was in 1962 with 16.1°C. July 2014 with an average high of 25.2°C was the warmest July on record. July 2015 is the coldest. I’ll add this information as an update to the post.